While there is no substitute for the diagnostic expertise of your Veterinarian, not every solution can be found in your Veterinarian’s treatment room. Soft tissue injuries can heal faster and more effectively with a good recovery program including rest, regulated exercise and massage therapy. Ask your Veterinarian or call us at Flow Canine Wellness to understand how canine massage therapy can help your pet live a happier, healthier life. Maintenance Massage will improve circulation, remove waste from soft tissue and improve overall muscle tone. Your pet will experience an overall sense of well-being. Massage can be a useful tool to help anxious dogs through transitions like moving to a new home, or a new family member joining the family. Recovery Massage brings an added focus to trouble areas increasing the speed of healing by improving blood flow and ensuring healthy tissue repair. Recovery massage can also be helpful in impacting an old injury by working through tissue adhesions and encouraging improved range of motion. 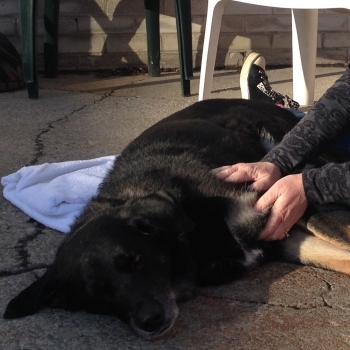 Senior pets and those recovering from a health issue will benefit from Recovery Massage. Performance massage will help your athletic or working dog operate at peak performance. Just like elite human athletes your dog will benefit from massage during intense training periods and before and after competition.